Yesterday, I presented at NETA, an ed tech conference in Omaha. I’ve presented at several conferences at local and national levels since grad school. I’ve presented on how female athletes choose to be photographed, how administrators censor online student speech, how pop culture can infuse relevancy in an English curriculum. But yesterday’s presentation had me completely rattled. My session was scheduled to follow the keynote speaker, which by 9:30 a.m. just added to the rattling because he was such a dynamic presenter. Toss in some minor anxiety over unreliable wifi–so I couldn’t use my phone to control my presentation–and my VGA adapter sitting at home, and my mind was blank at 10:20. After I connected my computer to the projector, I stood at the front of the room and watched people filter in…and filter in…and filter in. I panicked a little more, and my mind grew more and more blank. I was really hoping that maybe 15 people would show up. A lot more than 15 showed up. I wrote and doodled for a good five minutes, looked at my phone, and at 10:29, mind still pretty blank, I started my presentation. I can’t remember the last time I was that nervous in front of an audience. But once I launched into how I use Google Classroom, muscle memory took over. My brain remembered that I am a teacher, and really, that’s what good presenters do. They teach. 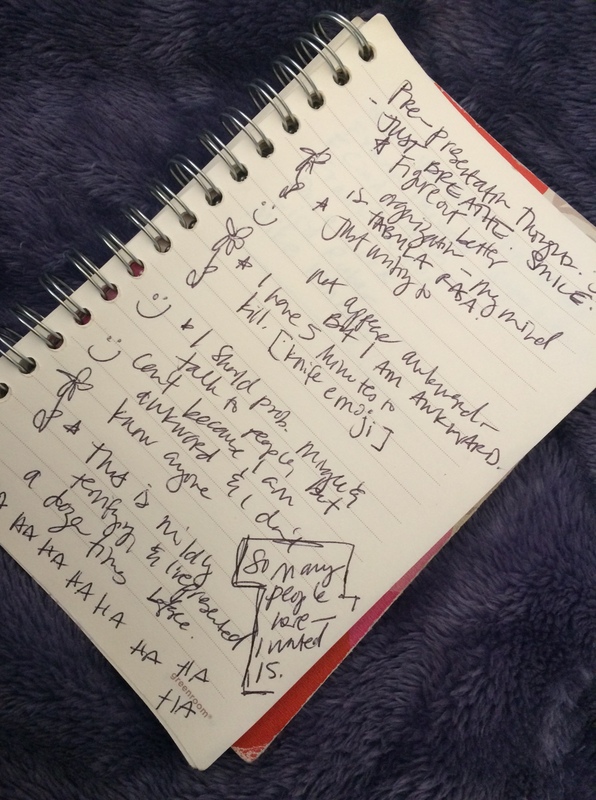 Why would I blog about my pre-conference neuroses? Because I am human. I teach writing, and I have 100% perfect empathy for how my students feel when they solicit feedback (or even when they don’t and I just give feedback anyway) for their writing, because in my own published writing, I get feedback. Excruciating feedback. Feedback that makes me drop to the fetal position and eat my hair for a good 20 minutes before sitting back up, drying the tears, and getting to work. I ask my journalistic writing students and my newspaper students to interview people all the time. Sometimes they are lucky and get to interview people they know. Sometimes not. And I have 100% perfect empathy for how my students feel when they have to talk to people they don’t know. One of the overarching themes of the conference was relationships. That in spite of it being a technology conference, we mustn’t allow the technology to supplant human interactions, feelings, or relationships. That is why I chose to blog about my panicked pre-presentation thoughts and doodles. To remind both myself and my students that at the end of the day, I am human. I get nervous. And that’s okay. ← Previous Post Finally! I Know Why I’m Not Married! Next Post → Why I’m Not Married, Part II. I was in your session and loved it! I’m doing a similar session in June and was hoping to steal some ideas. I never in a million years would have guessed you were nervous. You had so many great things to share. You delivered exactly what you said you would. Everything you shared was totally relevant and I was completely impressed that you included the most up-to-date changes to Classroom. It seems like there are important changes every couple of weeks which doesn’t make it easy to keep up. Job well done! Julie, I just love reading your blogs! I still get mind blank sometimes before I present! I am so proud of you and all that you have accomplished. Can’t wait to read your book!! Julie, thanks for the insight. Being real and human is a very brave thing. Our colleagues, as well as students, need to see that in us.